In refurb news, Characters in Flight at Downtown Disney has been cleared for take off and is offering an early bird deal. Flights before 10:00 AM are just $10. That is an $8 savings over the regular adult ticket price. No word on how long this offer will be available. The refurbishment start date for the California Grill at Disney's Contemporary Resort has been pushed back. The new closing date is 2/2/2013, with a reopening in late summer 2013 (no precise date is yet available). The restaurant was previously scheduled to close on 1/6/2013. Splash Mountain is scheduled to be closing for a lengthy refurbishment from 1/2/2013 to 3/19/2013. While this is bad news for those traveling during those dates, a lengthy refurb on Splash Mountain is desperately needed to fix a myriad of broken effects. 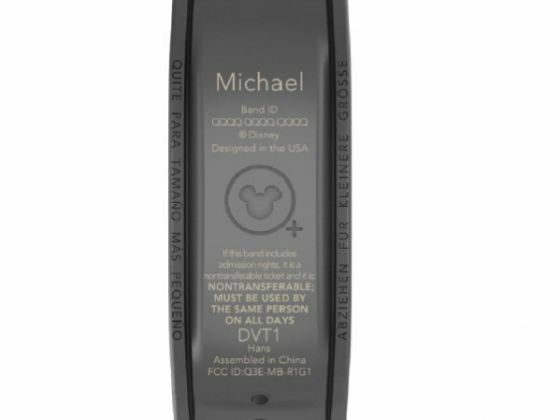 Disney's NextGen RFID FASTPASS bracelet has been listed on the government FCC website, including an image of what it looks like. 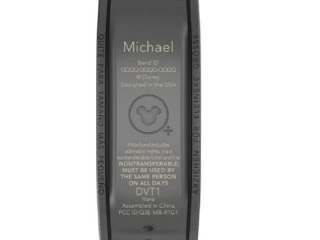 The bracelet, called "Magic Band' is battery powered, is designed to be disposable, and includes the now familiar NextGen Mickey logo, and what appears to be the wearer’s name for easy ID in groups. The RFID bracelet will be the driving force behind much of Disney's NextGen initiative, which includes ticketless park entry, ticketless FASTPASS, attraction personalization, touch-to-pay purchasing and more. "The radio of the device, Model MB-R1G1, is a wrist worn arm band that transmits a 2.4 GHz signal to an indoor wireless infrastructure. The PCB assembly is potted in plastic and completely overmolded with thermal plastic polyurethane. The band has no on/off switch and is powered with a non-replaceable coin cell. The PCB assembly also includes a passive UHF RFID tag radio and a passive HF RFID tag radio." The Passholder preview registration for the new Fantasyland has been delayed. Originally set to begin at midday 10/8/2012, the registration process will now open on 10/15/2012 at midday. Below is the full text from the Passholder website. "We are experiencing technical difficulties with the Annual Passholder New Fantasyland preview sign-ups that have made it necessary to delay the sign-up date one week. The Walt Disney World Annual Passholder New Fantasyland preview sign-ups will now begin on Monday, October 15 at 12:00 noon Eastern Time." The Walt Disney World Resort today announced that it’s looking for its first ever ‘Walt Disney World Family’ – and it’s looking in the UK. This never been done before search will unearth a unique family that captures what Walt Disney World is all about. Starting today, UK families will be able to enter at www.disney.co.uk/waltdisneyworldfamily simply by explaining what makes their family one of a kind and why they best represent the attributes of Walt Disney World – “fun, relaxation thrills and memories”. Disney's Animal Kingdom Lodge has introduced a new nighttime safari tour on the Sunset Savanna exclusively for guests of the Lodge. The hour long, after dark tour takes guests through the savanna for a close-up look at the animals. Night vision goggles add to the excitement. The cost is $70 per guest for ages 8 and up. There is a 10 guest maximum, with tours taking place Wednesday and Saturdays at 10:00 PM. Olivia Newton John has been removed from the schedule for the 2012 Candlelight Processional. Originally scheduled to perform as the celebrity narrator on 12/142012 to 12/16/2012, those dates are now listed by Disney as TBA, with no replacement yet listed. Disney has finally announced that Test Track will be reopening to guests on 12/6/2012. This replaces the ambiguous “late fall” opening date previously listed. Coincidentally this is also the official grand opening date for the Fantasy Land expansion. Disney's Grand Floridian Resort is now equipped with an LCD screen at the bus stop giving what appears to be live information about the upcoming bus arrivals. The screen lists each destination, and the precise arrival times of the next two arriving busses. Disney Research cast members have been posted at the bus stop surveying guests about the system. Let us hope that this will not be the only resort to get these screens and that the information is accurate. Shrunken Ned's Junior Jungle Boats (the mini radio controlled boat attraction next to the Jungle Cruise) have been removed. Construction walls have been up for the last few weeks, and have just been removed to reveal that the attraction is completely gone. It is unclear what the long term plans for the area will be, but for now the area will be used for stroller parking. Construction walls around the new Fantasy Land expansion are beginning to come down around WDWMagic.com has some excellent day and nighttime pictures of this highly detailed area. Follow the links below the check out the images.